Fourth-grader Kameron See makes sure he’s ready at the door by 5 p.m. every day. He waits for his coach to pick him up for practice. “Football is my life. I like football and basketball,” he said. Part of why he likes it so much is because of his coach, Charles Dorsey. What he’s learning are life principles like leadership, responsibility and most of all sacrifice, which is what Coach Dorsey shows leading by example. 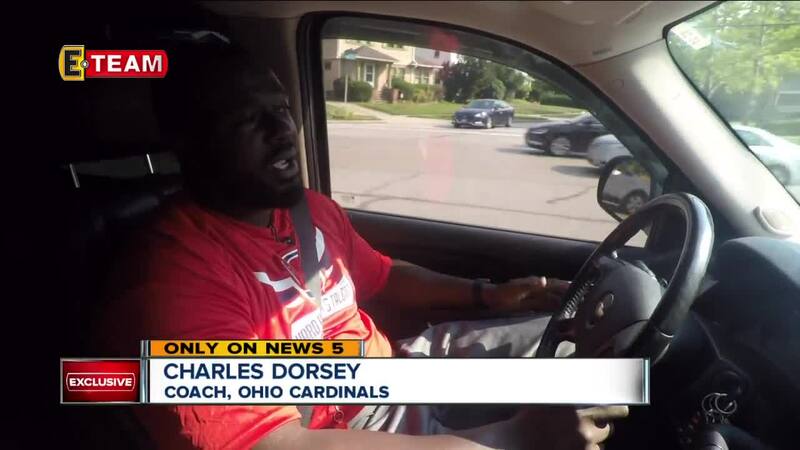 “I leave work, come home, get changed, kids call, need a ride, go pick them up,” Coach Dorsey said. Before he’s calling the shots out on the gridiron, he’s rolling around in his SUV. Taking time away from his family,to impact the next generation of young African American boys. He and other coaches for the Ohio Cardinals Football Team sacrifice their time, picking up as many kids as they can hold four days a week. It’s a passion project for Coach Dorsey, one that started nearly eight years ago. “A lot of kids can’t go to different neighborhoods and be safe and parents won’t let them participate unless somebody’s willing to come pick them up,” he said. And his passion is felt by the players. “I think he cares,” said See. But with interest in his team growing and the need for transportation becoming a greater need, Coach Dorsey said it’s getting to the point where his SUV just isn’t cutting it anymore. “I think he needs a van,” See said. So he’s going to the community for help. Asking for donations in order to get around to everyone who may need it. “We feel like if we get a van, we’ll be able to reach more kids,” Coach Dorsey said. His team of 75 could expand by nearly 25, which for him that means more kids he can impact in a sport that he says is more than just winning football games. “We’re not just coaches, but we’re also mentors and we act as social workers and we do all these different things for these kids just to instill those values that are important,” he said. The Ohio Cardinals first game of the season will be this Saturday.